This entry was posted on December 7, 2011. Bookmark the permalink. It’s that time of year again. Every night, after the kids are finally in bed, your evenings are spent frantically searching online for the perfect gift for everyone on your list. Your “list” (if you’ve even found the time to make one) is posted everywhere: sticky notes throughout the house, two different apps on your smart phone (because you haven’t decided which one you like better), an elaborate Excel spreadsheet, and a handwritten note on the back of a Starbucks receipt in your purse. You’re constantly blaming yourself for the cynical remarks you made about stores filled with Christmas reminders in October when really you should have started your shopping last summer. You’ve blown your budget and are desperate to find ways to stretch each dollar and when your head finally hits the pillow for a good night’s rest, you spend the next hour adding ten more people to the list you swore five days ago you were done with, again. How many more days until Christmas? If you’ve been lucky enough to receive the ever-anticipated Pinterest invitation, take a few minutes to relax and explore a virtual world of picture ideas. The word “crafty” has been redefined. It’s now become a reflection of personal expression in our new age of frugality, living simpler, and value placed on homemade items made in the U.S.A. If the gift-searching has left you weary and desperate for a project, here are a few simple “garden gift” ideas to spark your inner Martha Stewart. 1) Decorative Indoor Cachepots: Cachepots are ornamental containers used for holding and concealing a flowerpot. They can be made of anything: metal, ceramic, plastic, you name it. I’ve used metal ice buckets, small, brightly-colored trash bins, metal tins, and even old Tupperware. The fun part is making it “yours” by painting, etching, adding ribbon, even decoupage. 2) “Embellished” greenery: Over the summer, I gave a friend of mine a pothos plant as a thank you gift for watching my son for a few hours. I chose a pothos because they are very easy to care for and are great natural air filters for the home. Pothos, however, can be quite boring to the eye because they don’t flower. To add interest, I created a fun cachepot and “embellished” the plant by inserting delicate pink silk flowers into the soil. My friend was so proud that she was keeping the plant alive and blooming until finally, after two months, she realized the flowers weren’t real. 3) Living Wreath: Living wreaths are becoming very popular as vertical gardening takes off. These can be done in a variety of ways including planting seasonal flowers such as pansies and violas or succulents like sedum. The key to a living wreath is finding the right form to plant. Forms may be found at garden centers or in the floral department of your local craft stores. Living wreaths are impressive to even the greenest of thumbs and an excellent gift for the gardener on your list! 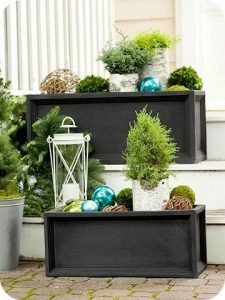 4) Outdoor Seasonal Container: Outdoor containers are the gift that keeps on giving, month after month. This is a great time of year to buy containers at your local nursery – just last week Pike was having a sale up to 70% off. The standard rule of thumb for planting containers is thriller, spiller, and filler. One example for an easy winter container would include a pencil holly (thriller) planted in the center of the pot, a couple of ivy (spiller) planted in a corner or two to grow down the side, and a handful of violas or pansies (filler) placed around the holly. Once planted, cover the soil with mini-nugget mulch or soil conditioner and water. Embellish it with a decorative garden stake and watch it grow! 5) Christmas Centerpiece: Centerpieces can be as simple as finding a handful of greenery from your garden. For Thanksgiving I gathered snips of thread-branch cypress (evergreen), a Japanese maple branch with attached leaves, twigs from a red twig dogwood, a few clippings of nandina, and camellia flowers. The arrangement lasted days for a total cost of $0. Hopefully I’ve inspired a few of you to DIY!! Better yet, get your children involved. What could be more fulfilling than a Saturday afternoon in December spent crafting with the kids while listening to a little Christmas music? Keep it crafty and enjoy the season!